email photos – Learn Picasa and Google Photos! I’ve heard of people going to great lengths to prepare and email a picture. First they (1) edit it and save the changes, then they (2)export it to get a smaller size, then they (3) open their email program and use the attach feature, having to (4) hunt thru their folders to find the exported picture(s) to attach. Finally, they write their email, address it and send it. Picasa has an Email Button! When you use Picasa’s email button, it opens the email program you specify. Either the default email program that is installed on your computer, or Gmail. We recommend Gmail, since both Picasa and Gmail are Google products, they work together very well. If you prefer not to use an @gmail.com address, you can set Gmail to ‘Send mail as’ another address. 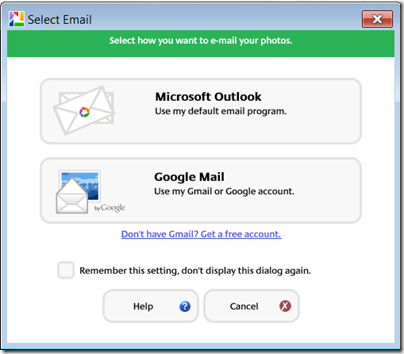 If you want to use your computer’s email program and it’s not coming up automatically, here’s the Official Picasa Help on setting up your default email program. Last, but not least, we recommend that you not email pictures at all! If you send me 20 pictures of your latest vacation via email, what am I supposed to do with them? I’d rather you sent me a link to where I can view them online any time I want without them filling up my Inbox. So, use the Share button to upload to Picasa Web Albums or Google+, or Export to your Dropbox/Photos if you have a Dropbox account. Geeks on Tour is a membership website with hundreds of Tutorial Videos on topics of interest to travelers, such as using your smartphone, managing digital photos with Picasa, Route-Planning with Streets and Trips, and sharing your travels with a website using Blogger or with friends on Facebook. You can subscribe to our free e-newsletters, or become a paid member and be able to view all of the videos in the Learning Library. 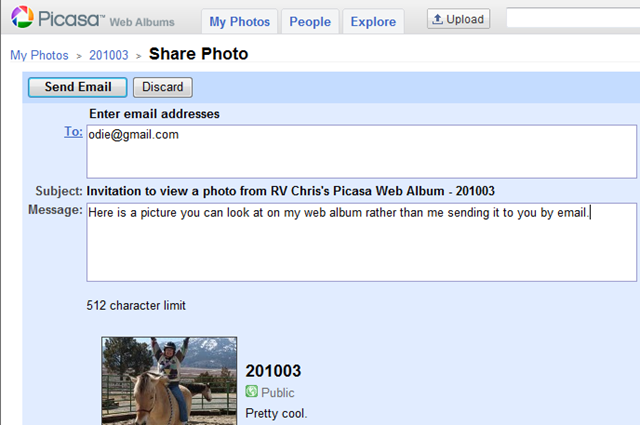 Picasa makes it very easy to email your photos. It even takes care of resizing the pictures appropriately. All you have to do is select the picture(s) you want to send and click the Email button. If you use this technique you are also guaranteed that your recipient will see the picture as it looks in Picasa – with all your edits applied. You must already have an email program. Picasa doesn’t actually perform the emailing for you – it just prepares the photos for attaching, then opens your email program. All you have to do is address it and click Send. Picasa can use your default email program installed on your computer – like Outlook, or Eudora, or Thunderbird. If you don’t have an email program on your computer, you need to use Gmail. Gmail is free and easy – and you know it will work well with Picasa since it is also part of the Google family of software. The only objection I hear from users is that they don’t want to use a gmail address. Everyone knows them at another address (e.g. JoeSmith@juno.com) that they’ve used for years and they don’t want to change. You don’t need to change your email address! Gmail has a cool feature called ‘Custom From Address.’ So, using Joe Smith’s example above, he can have a Gmail address called JoeSmith123@gmail.com. But he can change the settings in Gmail so that all mail that is sent is From JoeSmith@juno.com. You must of course prove to Gmail that you own the other address, and follow the Custom From Address instructions to set it up. Make sure to assign the ‘Default’ designation to the address that you want to be used most often. You can set up Gmail to send and/or receive from many different email addresses. I have my account set up to reply to messages using whatever address was used in the original email. So if you send an email to me@xyz.com and I reply, the reply will be From me@xyz.com. If I send a new email, it will be From whatever address I have set up as the Default. Even though I use Gmail for all my email, you will almost never see an email from me@gmail.com. I get a lot of questions about problems using Picasa to send email with the above accounts. Although I do know that people have been able to configure their Default Email to work successfully with them, it is a lot of trouble, and a subsequent upgrade to Picasa, or the email software, or your browser, can render it useless. I say don’t bother! Just get a free Gmail account and set it up to use your other address as the default ‘From’ address. 4/1/10 Note: this error has been fixed by the folks at Google. The article is still worth a read to see how to find out what has been fixed or not, as well as how to use Web Albums to share your photos instead of emailing. I checked the PIcasa user forum and found that lots of people were having the same problem. Google has acknowledged the problem. They’ve been working on it and have now posted a notice that they’ve identified the problem and they know how to fix it. The fix will be in the automatic Picasa updates that will be pushed out to all users starting next week (3/29/10.) It’s always a good idea to check the Picasa ‘Known Issues’ page when you get an error so you know if it’s a problem they’re working on before you go to too much trouble trying to fix it yourself. Meanwhile, here’s another way to share your photos. 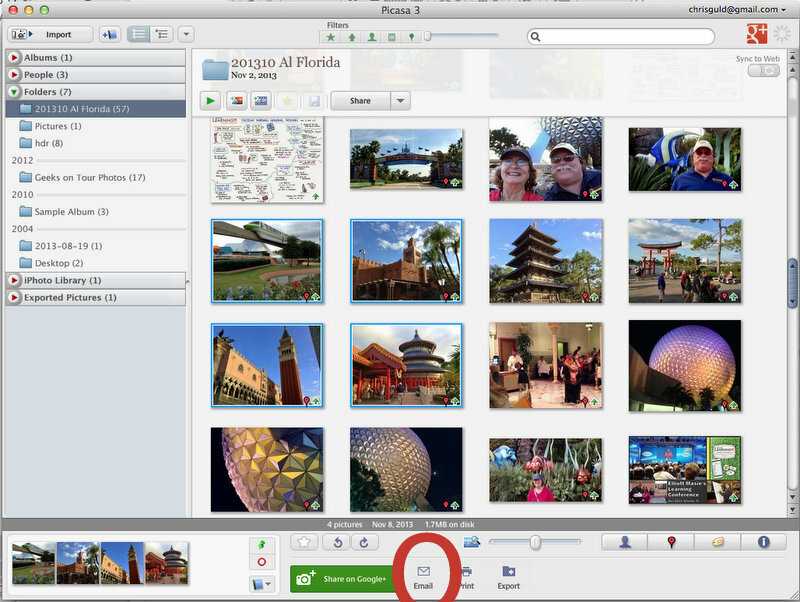 Upload your photos to a Picasa Web Album. Once it’s there, you can view it in the Album, then click the ‘Share’ button. You just address it like any other email, write a message and send. They can see the thumbnail (small version) of the photo right in the email. If they click on ‘View Photo’ that will take them to the photo on your Web Album. I think this is a better way to share photos anyway. What do you think? Leave a comment. Have you ever opened a photo attached to an email and found yourself staring at a person’s eyeball taking up the entire screen? That’s what happens if the person sending the photo doesn’t know about resizing it first. That is, if you receive the photo at all! It may be so big that your email inbox simply rejects it. Here’s a photo of my motorhome as you would see it if I emailed it to you full-size. This is how it would appear in many programs – then you would need to scroll around to see the entire photo. This photo would be taking up a lot of space in your inbox as well – 2.7 megabytes to be exact. And, if you have a mailbox that is limited to 10 megabytes, it would fill up real quick, and any further mail would be rejected. There lots of ways to send photos with email and resize them first. Picasa is my favorite. 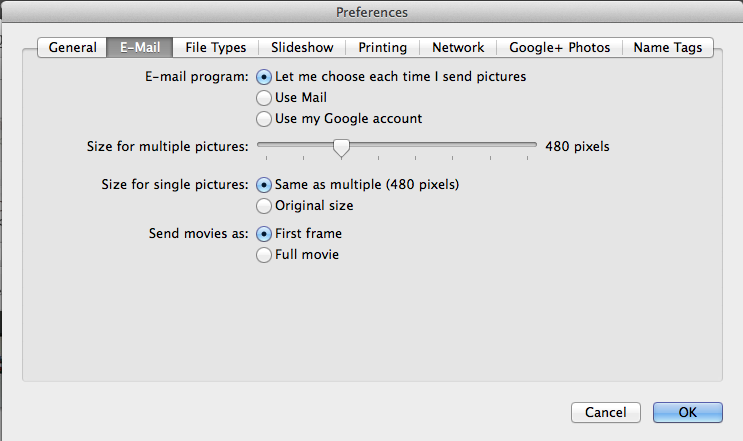 You simply select the photo (or photos) you want to send, click the email button, and Picasa does all the rest. Watch the quick video below to see how.